Come and pick your own fruit over the EASTER long weekend. This will be the last weekend we will have fruit for picking. Pick your own will then be closed for this year. 09/04/19 - We are now picking black muscat table grapes, apples and plums. All peaches, nectarines and figs have been picked for this season and are now finished. Now picking golden queen peaches, grapes, plums and apples. This weekend we have apples, pears, nectarines, plums and figs to come and pick. For the rest of this season pick you own will now only be open weekends. We will no longer be open weekdays. Thanks to all our customers for your patience whilst pick your own was temporary closed. I am saddened to let you know my father, Arthur Treweek, passed away early this week. Thanks for your thoughts and well wishes during his illness and over the past couple of years. Due to extreme temperatures we currently have no fruit available for picking. Therefore pick your own will be temporarily closed until the next fruit is ripe and ready to pick. Fruit is still available for sale in the shed shop. We have extended our opening hours today for New Years Day till 4pm (not 2pm). We want you to have the best chance of picking the last of the cherries for this season. We still have lots to pick and they will still be available for the next few days. We still have lots of sweet cherries ready now for you to pick. Available daily from 9am-4pm until the new year. Sour Cherries are also available now to pick your own. We still have plenty of cherries available to pick. We have just started picking Sweethearts. 27/12 to 30/12 Open 9-4. Need something to do this weekend? Come join us Thornbrook Orchard for pick your own cherries. Our trees are loaded with sweet cherries ready for you to pick! 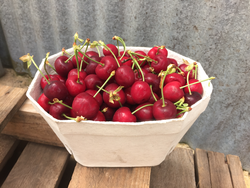 We have lots of cherries ready to be picked this weekend so come and visit us. We are open daily from 9-4pm. You have been waiting for it. Pick your own is OPEN!